I went to Mexico looking for hot chocolate, but all I found was Starbucks. From narrow sidewalks in Puerto Vallarta I saw hundreds of big bowl margaritas in street cafes and styrofoam cups in the hands of crowds in coffee bars, but I didn’t see any Mexican hot chocolate. I remembered the giant pottery tumbler of warm, foamy chocolate I drank years ago at a market stall in Oaxaca—but I couldn’t find it in beachside Mexico. Bars of Ibarra and Abuelita Mexican chocolate take up shelf space in American supermarkets, but I find this kind of chocolate too sweet and artificially flavored. 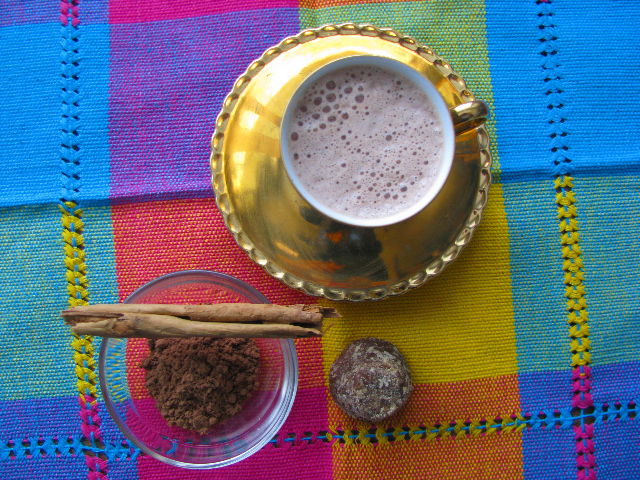 Mexican hot chocolate is usually laced with canela, Ceylon cinnamon, that enhances chocolate. I prefer just enough dark sugar and a touch of vanilla to round out the drink, which I can easily make myself. At home I select natural cocoa powder for rich chocolate flavor and less fat. Since it’s vital to include canela rather than the harsher ground cassia or American cinnamon, I need to grind the cinnamon myself. An old coffee grinder works perfectly. Cooking deepens the flavor of cocoa, so I decide on a pudding-like base that can be prepared ahead of time and scooped into hot milk or water whenever needed. This makes the hot chocolate as simple as tipping in a glug of chocolate syrup or a dose of drinking chocolate powder yet it offers a greater wallop of flavor, less sugar and no chemicals. Here’s Mexican Hot Chocolate for a cold winter’s nightcap, a chilly morning cup or an afternoon pickup. *Natural cocoa has not been “Dutched” or processed with alkali which makes it milder and darker. Hershey’s Natural Unsweetened and Nestlé Toll House are common brands. **Piloncillo is unrefined Mexican sugar found in ¾ ounce cones. ***Canela is available in stick form wherever Mexican spices are sold. This thin, coiled cinnamon from Sri Lanka has a delicate, almost citrus-cinnamon aroma. Grind it often and use it freely. You’ll find it much nicer than common cinnamon, but you will need to use more. If you choose the stronger “apple pie” cinnamon, use only 1/8 teaspoon for this recipe. In a small, heavy saucepan, stir together the cocoa, sugar, salt, cinnamon/canela, and cornstarch. Gradually add the water, bring to a simmer and cook over low heat until pudding-thick, about 1 minute. You should have 6 tablespoons of cocoa base. Heat 1½ cups of milk (or use water or a mixture of water and milk) and whisk in the prepared chocolate; add vanilla. Heat as desired and create foam by whipping with an immersion blender just before serving. Makes 2 cups. Note: to make tiny espresso cups of hot chocolate, use 1 tablespoon of the base for each ¼ cup of hot milk or water. The lowly cabbage shines in legends about what to eat in the New Year for health and good fortune. Although it may have first been touted because it was available and cheap, we’re learning more about its cruciferous benefits. To add hype to the claim comes the fermented variety, sauerkraut. Fermented vegetables boost our immune systems, aid digestion and pack in vitamins. The great Choucroute Garni laden with sausages and potatoes from Alsace is one of Europe’s classic dishes. Aware of the need to lighten up, I now make French style sauerkraut with just a fraction of richness and pork and it’s still splendid. Each fall at the final farmer’s market I buy a huge green cabbage to shred, salt and pack into a gallon plastic container. Weighted under a saucer topped with my five-pound brass mortar, the cabbage brews in its own juice in the cool garage until one day the bubbles spew out the odor of mustard, telling me the fermentation has passed. I give it a careful eye from day to day, making sure the liquid stays up and clean. Four to six weeks later, I taste the first sauerkraut. Fresh sauerkraut is available in any supermarket today, but it’s fun to watch the transformation of a shredded cabbage and a couple of handfuls of salt into one of our oldest vegetable staples. It’s even better to have braised sauerkraut for supper. Cut bacon in 1-inch pieces and sauté until golden. Remove to side dish and reserve. In 2 tablespoons dripping or oil, sweat the onion, carrot, celery and diced apple until tender. Add garlic, thyme, bay leaf allspice and juniper. Stir in the sauerkraut and cabbage. Mix well and pour over the wine plus ½ cup water or the beer. Cover and simmer at least an hour or, better yet, an hour and a half. If possible plan to simmer the sauerkraut early in the day and reheat it at serving time for enhanced flavor. Potatoes may be steamed on top of the sauerkraut during the final half-hour. 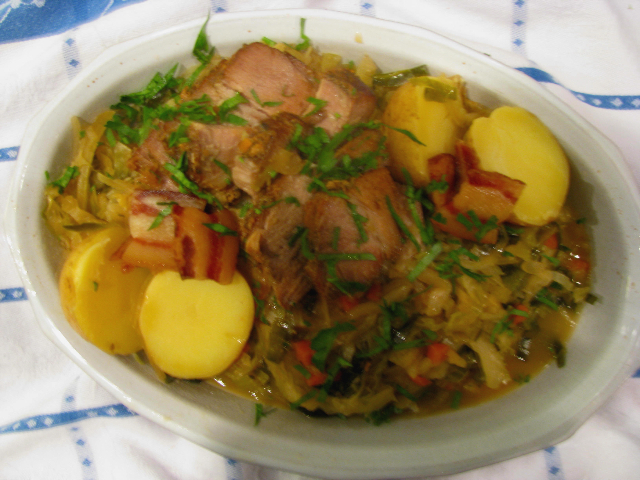 Serve the sauerkraut with potatoes, sliced pork and garnish with bacon. Makes a cold night’s feast for 3-4. You are currently browsing the Mary Jo's Kitchen blog archives for January, 2011.